I love women that have a truly unique and arty sense of style who are not afraid to stand out. Shelley certainly fits that category with her unusual unique hairstyle taking center stage and she has never felt better. Let’s find out more about her! I was the only child of two working parents, and learned to be independent, resourceful, and to entertain myself from a very early age. Spending a lot of time alone fostered a love of solitary pursuits like drawing, reading, photography and watching old movies, and I still enjoy doing those things today. After moving from a small town to a larger city to attend university, I spent several years of working in record stores (remember those?) and other retail and contract jobs. 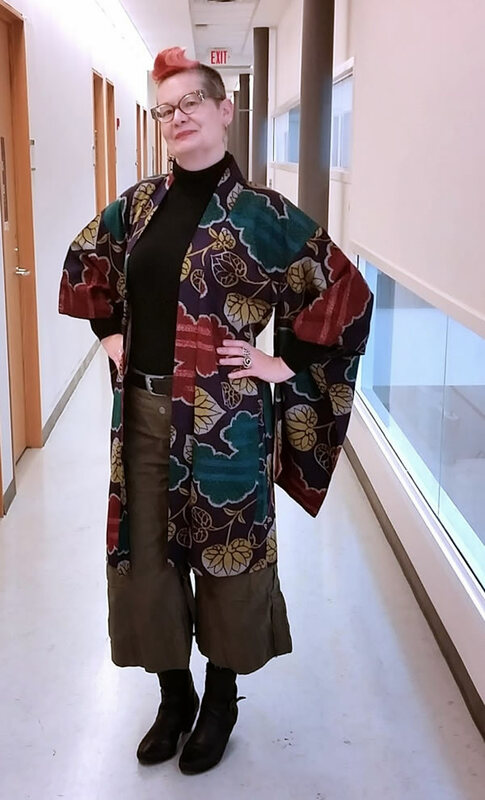 I found a “real job”, and work as a program assistant at a University in London, Ontario, which allows me to indulge in passions such as travelling and thrift shopping. I have no kids, but I have two smart and adorable pet rats. My current goals are to keep my wardrobe from taking over my too-small apartment, and meet as many of my blogger friends as possible. Can you tell us a bit more about your blog Forest City Fashionista and why you created it? I’ve always noticed other people who have unique personal style, and when I first saw Scott Schuman’s blog,The Sartorialist, I was inspired to do something similar for the city I live in. My blog began as a way of documenting the small population of creative and stylish people in London, Ontario. Eventually, I found I was shooting the same people over and over, and I was asked why I didn’t photograph my own outfits. 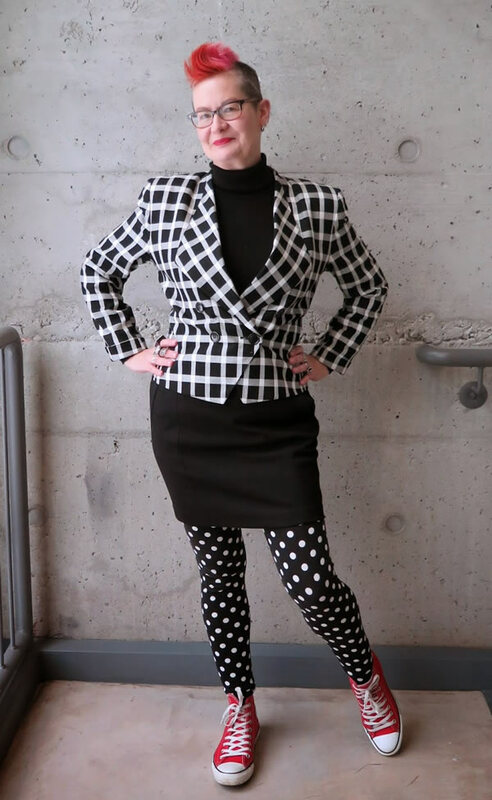 Over the last 5 years, my blog has evolved into a photographic diary of the outfits and adventures of a 50-something round peg living in a square hole. I would use words like playful, funky, and quirky to describe my style. I’ve loved secondhand shopping for most of my adult life and most of my current wardrobe is from thrift stores. 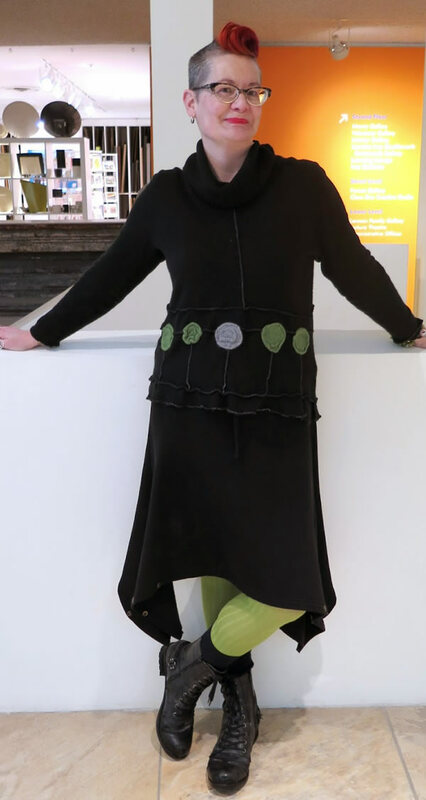 I do very little retail shopping for clothing, but when I do buy something new it tends to be black with an interesting shape and then I wear it with something vintage and brightly-coloured. I’m not very girly, although I do enjoy wearing full skirts with crinolines once in a while. My hair is probably my most recognizable component of my style – shaved back and sides, with a long section on top that is coloured orange and pink at the moment. Pretty much everyone that reads my blog recognizes me from my hair. My footwear is also important to me because I walk a lot, and can’t wear heels because of foot issues, so I almost always wear boots, Doc Martens, or Converse sneakers. I have lived the last 35 years of my life in London, Ontario, a city of close to 400,000 people, known for being the home of Western University, and a lot of insurance and law firms. I don’t think that this city has influenced my style, rather, I tend to stand out in this city because of its conservative nature. Not that I’m consciously aware of. My style became more professional and a bit more conservative when I got a full-time office job in my late 30’s and continued into my 40’s. Now that I have been in my current job for 10 years, I’ve found I can wear pretty much whatever I want to work as long as it’s clean and not too short or low cut, so I’ve felt free to experiment more in the last few years with different colours and shapes in my wardrobe. I did notice that I started wearing more colour in the last ten years, which could indicate that I’m mellowing out a little. My body shape has changed over the last 5 or so years which has meant that some things I wore 10 years ago don’t work on the body I have today. 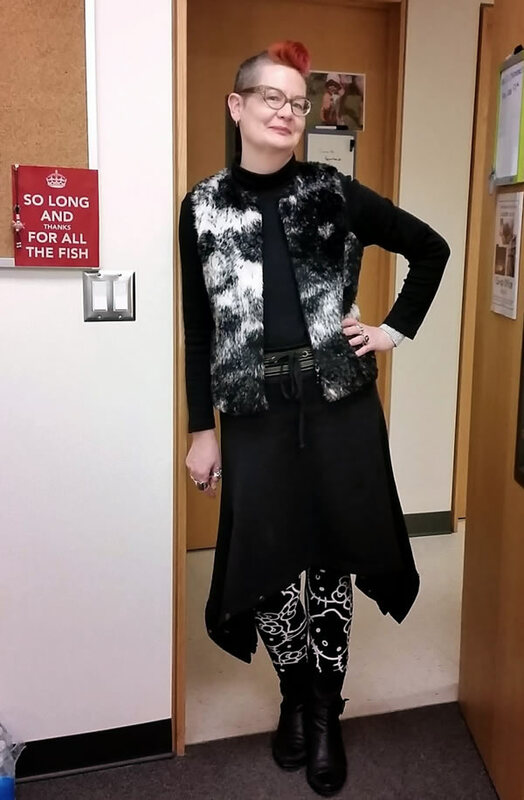 I’ve always worn what I liked, and what I felt good in at that particular time, so I’ve never given much thought to whether what I wore was “age-appropriate”. When style magazines would do those features on how to wear a particular trend at 20, 30, 40, 50 etc. I would often find the version suggested for the 20 year old appealed to me more than the boring one for the 50 year old. I have my own ideas of what I feel comfortable in, and what is appropriate for me, depending on my current body shape, so that is the yardstick I use rather than any societal rules regarding age-appropriateness. I would say that I’ve always been interested in fashion and style, even as a child when I was mesmerized by the outfits worn by Cher and Carol Burnett on television. 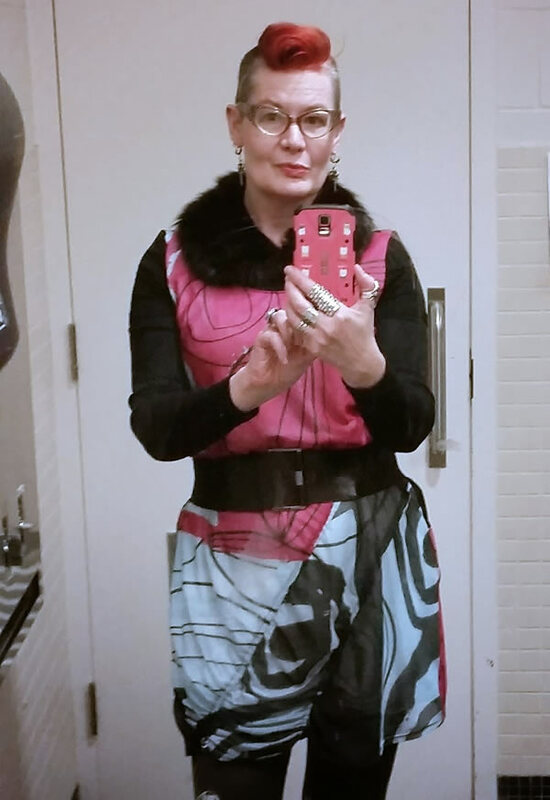 I didn’t really know what kind of look suited me best until I was into my 40’s, and I guess at this stage of my life I am less interested in fashion than I used to be, but more interested in whether the way I present myself through my personal style reflects who I am on the inside. How I look (by that, I’m referring to hair style, clothing and accessories) is important to me because my body is my canvas. I have always loved the arts – theatre, dance, film, visual arts, etc., and wanted to be an artist when I was a child, but I learned that I am not particularly talented in any of those fields, (although I am a good photographer), so what I choose to put on my body every day is my means of creative expression. I want to present my best possible self to the world, but also, a self that reflects my interest in colour, shape, texture, etc. I can’t think of any in particular – if it’s on the blog, it means I like something about the outfit and I feel good in it. When I was younger I would buy fashion magazines every month to see the latest trends, and occasionally incorporate them into my wardrobe, but I stopped doing that about 10 years ago. I still buy the occasional Vogue to look at the beautiful, unattainable fantasy clothes, but I no longer pay attention to what is “in” or “out” in a particular season. I don’t think I am in any position to give fashion or style tips as my style is very specific to me and my lifestyle. The only thing I would say is that being over 40 doesn’t mean you have to “tone it down” or start dressing to suit someone else’s idea of what women of a certain age are supposed to look like. I feel much more liberated in my style choices now than I did when I was in my 30’s because I really don’t give a f@*#k what anyone else thinks about what I’m wearing, and I feel much more comfortable in my own skin. (I have no idea where this quote originated, but it has become my mantra). I’ve never had a particular plan for my blog – it has evolved over the years from its beginning as a street style blog, but it has been a natural evolution, not one that was mapped out. It gets more difficult as the years go by (I will have been blogging as The Forest City Fashionista for five years in April) to find the time and ideas for blog posts, and I have reduced the frequency of my posts to once a week. I’m open to seeing where the blog goes, and to keep it going as long as I enjoy it, and believe that I am providing something that is enjoyable for my readers. Blogging has been the catalyst for developing cherished friendships with like-minded women all over the world, which I had no idea would happen when I started Forest City Fashionista. The other surprising benefit is that I am much more accepting of myself. I used to hate looking at photos of myself because of my crooked teeth, glasses, etc. and I’m much less critical of myself since I started to regularly put myself out there into the world via my blog, where I’m open to the judgement and criticism of others. I think blogging is a perfect way for women over 40 to connect with each other and the world at large, and show we have intelligent and interesting things to say, are endlessly creative, inspired and inspiring, and have fabulously diverse style! Many thanks to Sylvia for the opportunity to add my two cents to your interview series. Check out more of her fabulous style at her blog Forest Style Fashionista. You can also find her on Instagram. P.S. Shelley is one of the bloggers who will join the 40+bloggers meetup in Vancouver in July. I will be there too! If you like to join us, register here. I will also be in New York and am organising another blogger meetup there. Let me know here if you would like to come! I love this interview – Shelley is a fabulous role model! I completely agree with her about blogging being an incredible media for meeting people too! I love her answers in this interview – thank you for introducing Shelley to us! Love those HK leggings, and at 54 I would SO wear them! I love to take a mostly conservative look and add something fun and unexpected to the mix. She knows what she is talking about! PS…sadly Shelley won’t be able to make it to the meet-up : ( but lots of other great bloggers will still be there! That is a great comment. I must say, I have stepped away from beige as well. Although off white in winter is still ok for me. It’s just that white is so much fresher and I always prefer white over beige now. I still though you styled it well. haha, I always have this issue with my wife. Some shade of brown always seems to be her favorite color, even if she doesn’t notice herself. So it’s become a running joke between us. I think as long as the beige is not near your face it can create a good stage for other more attention demanding items, whether in colour or shape. But I love Shelley’s comment because of the humor in it. Thank you so much for this, Sylvia! I’m happy to be in good company as part of your interview series, and appreciate all you do to support and promote interesting and stylish women over 40. I wish I could go to the blogger meet up in Vancouver, but flights from Toronto are ridiculously expensive, and I already had two trips planned this year. I will be in New York in the fall, so keep me posted about your planned meetup there. A real pity Shelley. Hopefully another time… Thanks so much for taking part in this series. Rats…. I thought I would meet you there Shelley. Oh well…. if it cannot be, it cannot be. To coin a phrase, ‘darling you look fabulous’. You especially have a talent for black and white, I see! Silvia,I want to go back a few weeks.You mentioned that you were trying to work with your natural curl and that you might talk more about that later.I’m trying the same and would love to hear helpful ideas. I was but must admit, I have given up on it. I just could not manage the frizz and found it more difficult to manage. I will still try and write an article in a few weeks time. Thanks for introducing us to Shelley. What a beautiful woman. The fact that she dresses for herself is a great source of inspiration. I will be following her closely. 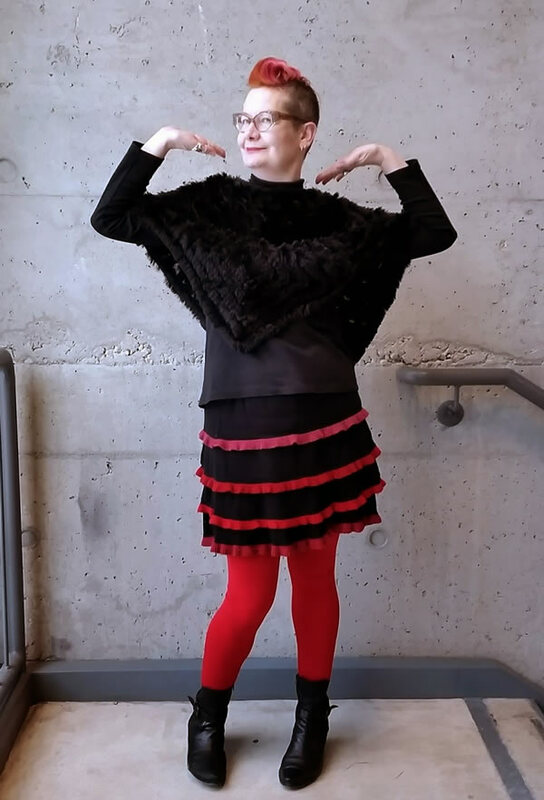 Shelley has a Awesome sense of Style – fun, funky, unique, bold, playful, joyful, colorful and creative! I just love it! Shelley is truly awesome. I look at her and think, wow, you live in London, Ont., and haven’t succumbed to the beige, YES BEIGE, atmosphere (I have first-hand experience). She manages to eke out delightful pockets of light and colour and excitement in style, people, and events, which she documents wonderfully on her blog. I admire her style, writing, and maverick attitude – “I’m going to New York!” And that’s that! I also like that she’s Canadian and stands out as a true style icon in this country. Thanks, Sylvia, for this interview. 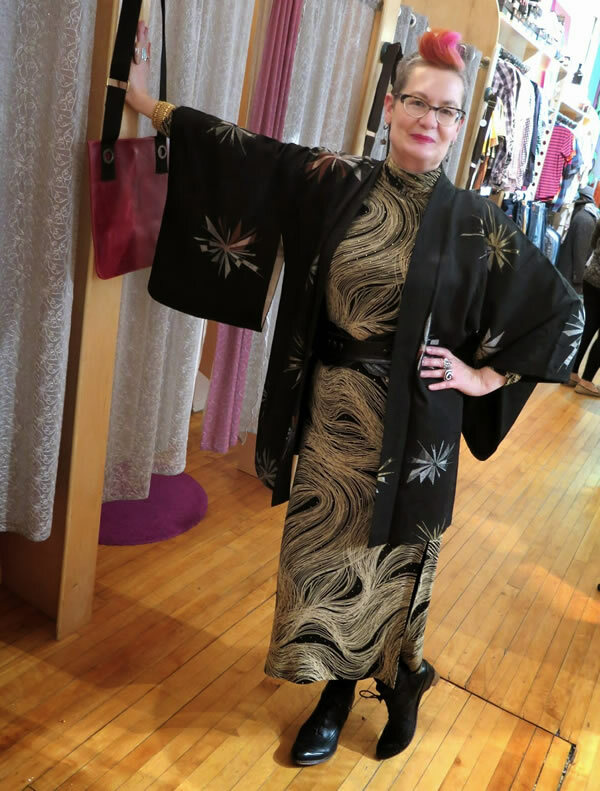 I love Shelley’s last outfit most and the second to last (the black with gold dress + kimono), but that is probably because they are closer to my own style. Her independance and way of looking at dressing is so refreshing, you cannot but admire her. She is her own. And not many people are, hence her feeling of being a 50-something round peg living in a square hole. Still, there is blogging to find the round hole you fit in. Great interview of Shelley, who is one of my favorite bloggers. I love her style, her writing, her creativity and her attitude. I met Shelley in person in NYC and here in Denver, and find her interesting and fun. 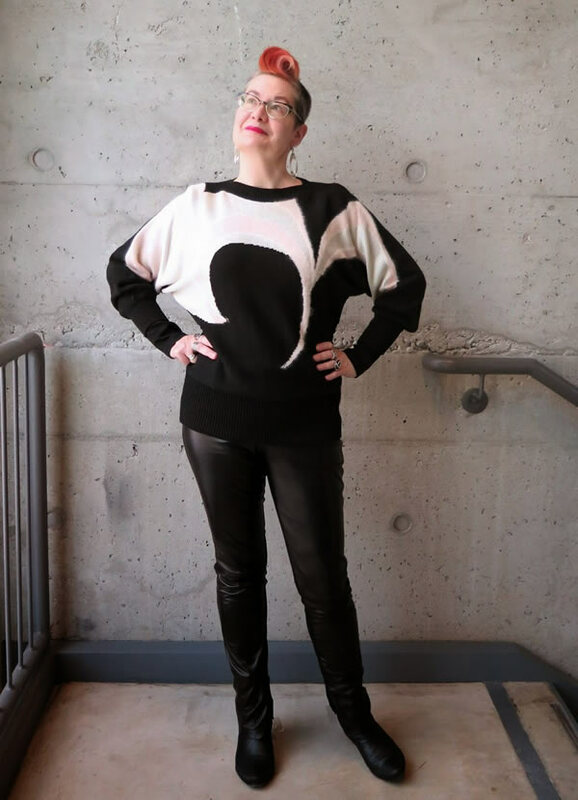 So happy to see that she has been included in your interview series, which has become “the” place to go to read about stylish and unique women over 40. Thanks Sylvia! I love Shelley! She’s one of my idols, and I’m so excited to see this and read about her. I’ll be one of the lucky ones meeting her in Vancouver. Great interview! Excellent interview of our dear Shelley, isn’t she a total gem! I count myself among the lucky to have met her, and she is just as honest, generous, and funny as she is fabulously stylin’. Wonderful to see so many of her super ensembles in one post. Oh Girl…you are too cool for school! I love your look! Next post: Share your style with #40plusstyle and get your looks featured!